Sekiro makes it a point to push back at players. From difficult bosses to winding world design, there’s friction that players need to fight against. Speedrunners and glitch hunters buck that trend. Last night while playing it, I broke out of bounds and it was a reminder of how even the most tightly composed game worlds hide beauty behind the scenes. It started when I watched speedrunner Elajjaz skip the boss fight against the Blazing Bull by jumping off a tree in the Ashina Outskirts, hopping on a wall, and traveling around the boss arena. As someone who likes to recreate the glitches I see other players perform, I did the trick in my New Game Plus playthrough. The timing takes a few attempts to get right but after a few minutes there I was, looking out over a massive void, standing where players were never meant to go. I’ve said before that I enjoy broken games. Seeing the cracks and seams is an oddly intimate affair. 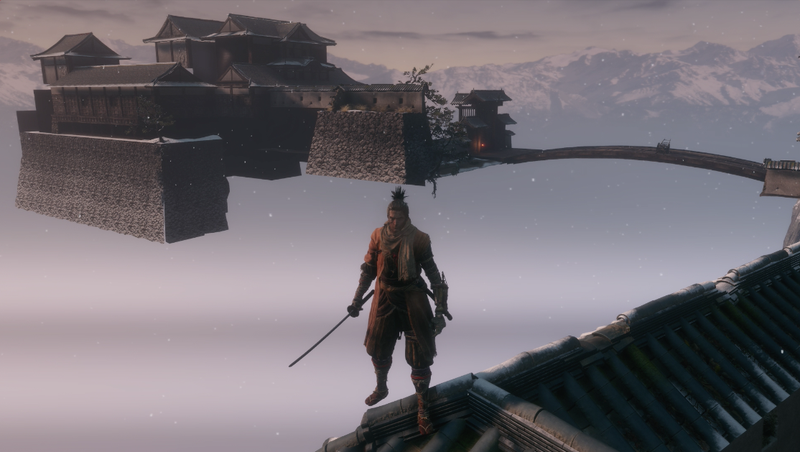 Breaking out of bounds in Sekiro is both a chance to see the world for what it is, and to assert a different kind of freedom and expression beyond learning boss attack patterns. From Software games depend on a very particular form of deliberate design. You progress from one area to another, clashing against enemies in a tricky but gradual curve upwards in difficulty. Areas circle around on themselves, containing shortcuts and set piece locations that players are meant to hit in a loosely guided order. It’s possible to go elsewhere—for instance, you can go to Dark Souls’ Blighttown before reaching the Undead Parish that you’re arguably meant to reach first—but there tends to be an invisible hand guiding you from one boss encounter to the next. Breaking out of bounds or skipping a boss shatters that intentionality. It’s a sort of transgression, a vaguely criminal act where the player places themselves and their agency over both the designer’s intention and the “reality” of the game world. In Sekiro, that’s particularly liberating. It’s also beautiful. When you break out of bounds in modern games, you usually get to see the world in an incomplete state. This is because games “cull” necessary geometry to save on data. Breaking out of bounds makes it difficult for games to detect where you are, which means you’re treated to images that can be strangely, accidentally evocative. Tangled trees hang in the void, soldiers stand guard in front of gates that don’t exist, bridges cross impossible gaps, and glowing items twinkle in emptiness like stars. In some ways, you learn what things are more important. What does Sekiro draw in first? Enemies and items usually, but also trees and mountains. It saves buildings and their facets for last, assembling them piecemeal. Sekiro is partially about the fall of the nation of Ashina and the degradation of man-made structures compared to the immutability of nature. There’s the majesty of heavenly spaces and the harshness of reality, which is always on the razor’s edge of crumbling. That theme is made even more obvious when you’re outside Ashina’s boundaries. It’s not intentional, but when I see Ashina Castle broken into fragments it makes me even more aware of how precarious the nation-state’s situation is. Glitches achieve a lot of different things all at once. They’re an intimate peek behind the scenes, they’re sneaky little game-crimes against designer intent, and they’re a chance to see the world from a new perspective. For Sekiro, breaking the game’s structure calls to mind the fall of Ashina and declining dynasty. Also, it looks really cool.